All else is commentary' says Robert Craven. Robert Craven works with the ambitious directors of fast growing businesses who feel that they could be doing even better. As a keynote speaker his style is challenging, honest and goading; free of business school hyperbole he makes his audience think. The Financial Times describes him as 'the entrepreneurship guru'. Cranfield School of Management say he is 'the closest thing that growing businesses have to a modern day John Harvey Jones'. Robert spent five years running training and consultancy programmes for entrepreneurial businesses at Warwick Business School. Running his own consultancy since 1998, he is now one of the UK's best-known and sought-after speakers on entrepreneurship. He is not full of theoretical rhetoric; he offers practical solutions - tangible business results. Robert's work on marketing and strategy has been widely published and acted upon by thousands of growing businesses. His two recent books Kick-Start Your Business and Customer is King, with Forewords by Sir Richard Branson, are both business best-sellers and have been described as 'truly inspirational' by The Independent. Alongside his numerous speaking engagements, Robert also does consulting work for, and is personal mentor to the leaders of a number of growing businesses in the UK. 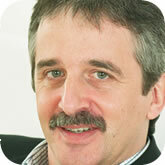 Robert runs The Directors' Centre, the award-winning management consultancy company. Due out in June, Bright Marketing will be published by Crimson Books.